This topic is about important FAQs, rules and troubleshooting in connection with ReVoltRace. ReVoltRace is a site for competitive online racing dedicated to the old school RC racing game Re-Volt. find old and new custom made tracks (collected from ReVoltZone, Re-Volt I/O, XTG and NawaKiwi and you can set times on that which will be included in a ranklist under tracks' page. you can compete at multiplayer races (B3L, B4L, Months and Custom Tracks Race). What should I know before starting use the site itself? You have to make an account to use the site's functions like posting results of races, open members' profile and this is the condition to be included at ranklists. If you made an account then you should validate it with the validation e-mail sent to your address. ...but wait.. I didn't receive any e-mail, I can't validate my account now? If this happened, then check your SPAM section of your e-mail account. If you haven't got the validation e-mail then feel free to contact me here via PM, e-mail or write a DM at Re-Volt Discord server and I validate your account as soon as I'll be able to. IMPORTANT! DO NOT use contact panel at the site, if you have any question, feel free to search me. What are the race types I can participate in? There are 3+1 type of racing you can participate in: Best 3 Laps, Best 4 Laps, Month Tracks race and Custom Tracks. Best 3 and 4 Laps races are the same kind of race type but with different lap count. In this type of races you have to set times on 13 stock tracks in a multiplayer race session with the desired lap count. However its name says 'best laps', only race time counts which is the totality of the laps at the races. If you rather looking for a competition where only lap times counts, feel free to check this topic. Month Tracks race is a special type of competition. Eight custom tracks are picked by moderator in each month. You have one month to set your best times on these tracks. 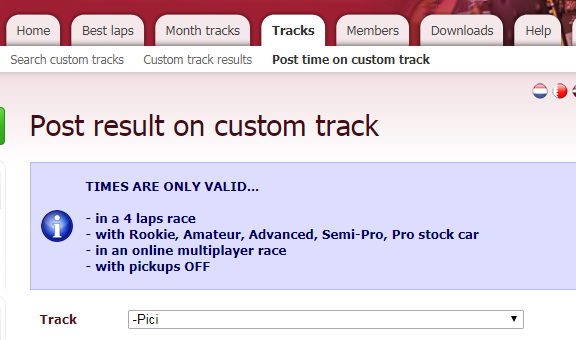 If you have picture about your record at a certain track, but you can't post that on Month Tracks section already, you can still post it using Post times on Custom Tracks section (check the pic below). 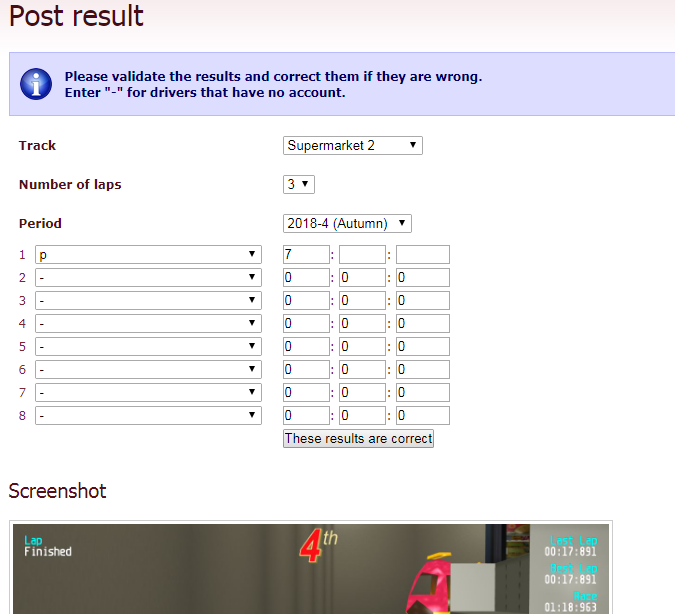 To submit results at the site, you have to take picture of the races you played in. You can use any picture taking program (Fraps, Gadwin Printscreen, Printscreen button on your keyboard & paste it to Paint or use F8 key which will take a picture and it save to your profile folder inside your RVGL installation. Important: better if you stick using your RVR account as name ingame as well (or something similiar to that, but more important: your time and name should be visible and readable (open spoiler to see correct and incorrect form). As you can see, player's time and account name is not clearly visible. Please use the correct form when posting a time. It makes approving process faster and you'll see yourself at ranklists sooner. Note: your picture's size should be under 190 KB. Pictures which have larger size you won't be able to post. To decrease size, resize it with the proper percentage with keeping picture's ratio. Posting process should be easy to complete. At first you have to open the panel you are about to post your results to. 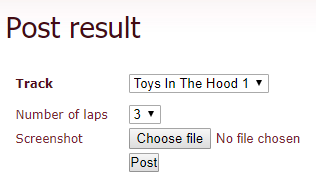 All you have to do is upload the picture, (at Best Laps races choose the played lap count first) choose track which is at the picture you're about to post and click to 'post'. Since RVR's engine is old, it doesn't read the recent Re-Volt versions' text coding and its fonts, so you probably got a messy-filled or simply empty ranklist. For now you have to fill them manually. Choose players' account, then type their times, and click to 'These results are correct' and that's it. These rules are also for Month Tracks race and Custom Tracks as well. Please avoid using Mystery car, since that is the form to show custom cars (which ones not included at the other players' Re-Volt installation. Hope I could help you with this summary. If you have any question or you think I missed something in connection with RVR, feel free to DM me at Discord or write down in comment below this post. Have fun and competitive races!